Snow Queen tube by The Hunter. Get it at S&C. Snow Queen kit from Bibi's Collection. Get it at S&C. Apply your edge psp frame. 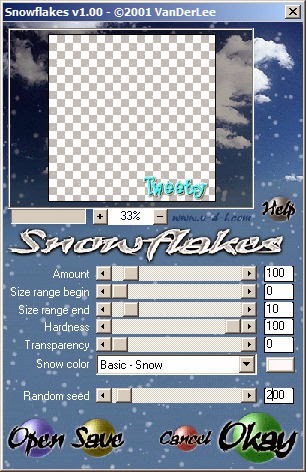 Apply VDL Adrenaline Snowflakes with the following settings. Apply VDL Adrenaline again but hit the random seed button once. Close the layer for now. Move clouds under the closed snow layers. Position under right side of the round frame layer. Move the church layer under all your closed snow layers. Use your deform tool to position over the top right side of the frame. Position at the bottom of the tree and cattails. Position over the bottom right side of the trees. Open the first snow layer you made. If animating go to edit, Copy merged. Paste into animation shop as a new animation. Back in PSP close snow layer 1 and open layer 2. Paste into animation shop after current frame. Back in PSP close snow layer 2 and open layer 3. View your animation to be sure it runs smooth and save. Labels: Animated, Bibi's Collection, Hunter, PTU, Scraps N Co.